Youth entries are open to youth 5-19 (age determined at time of fair). Adult entries are open to persons 20 years of age or older, and to a married person age 19 and under. In Food Preservation Division only, no items prepared by youth under age 9 may be entered. Youth must be at least 12 years old to enter classes by pressure canner method. Soiled articles will not be accepted. No exhibit shall be entered in the Johnson County Fair a second time. Because of lack of space, no exhibit shall be shown unless listed in the catalog. Exhibitors are limited to only one entry in each class. Entries in a miscellaneous class may not be a duplicate of an item entered in another class. In FLOWERS Section 1, an exhibitor may enter two dissimilar species under miscellaneous. All persons must be on the fairgrounds personally, or have a representative to check their exhibits in and check them out on the closing day of the fair. All exhibits (except flowers & baked goods) may be checked in between 1 p.m. and 7:00 p.m., Monday, August 20. Flowers and baked foods, including all exhibits, can be entered on Tuesday, Aug. 21, 9:00 a.m. to 11:00 a.m.
All Exhibits must be checked out between 1:30 p.m. and 2:30 p.m. Sunday Aug. 26. The exhibit building will close Tuesday, Aug. 21 at 11:00 a.m. and remain closed until judging is completed. It is the exhibitor’s responsibility to insure that exhibit items are entered according to the rules. Exhibitors should check each department for additional rules and class listings, as changes are made each year. The management reserves the right to exclude from exhibition any article it deems unworthy or inappropriate. Framed entries must be ready to hang with a standard picture wire hanger. No sawtooth hangers, soft drink tab hangers, string, twist-tie, or filament hangers will be accepted. Items meant to be displayed hanging must have a device by which to hang the item (above framed entry rules apply). Superintendents have been instructed to reclassify an entry if it does not fit the class in which the exhibitor entered the item. Should the exhibitor already have an item in the class where the reclassified item should be entered, the item will be disqualified and set aside for the exhibitor to pick up at the conclusion of the fair. A class will not be created to fit the entry when entries are taken. The decision of the superintendents is final. Every exhibit will be under the control of the superintendent and every possible care will be taken to prevent damage; but in no case will the Johnson County Fair be responsible for any damage or loss that might occur. The Danish Point System will be used for judging all items. Worthy exhibits will be rated blue, red, or white, based on merit. There will be premium money for all blue and red awards. No premium will be awarded when an exhibit is unworthy. The decision of the judges is final. 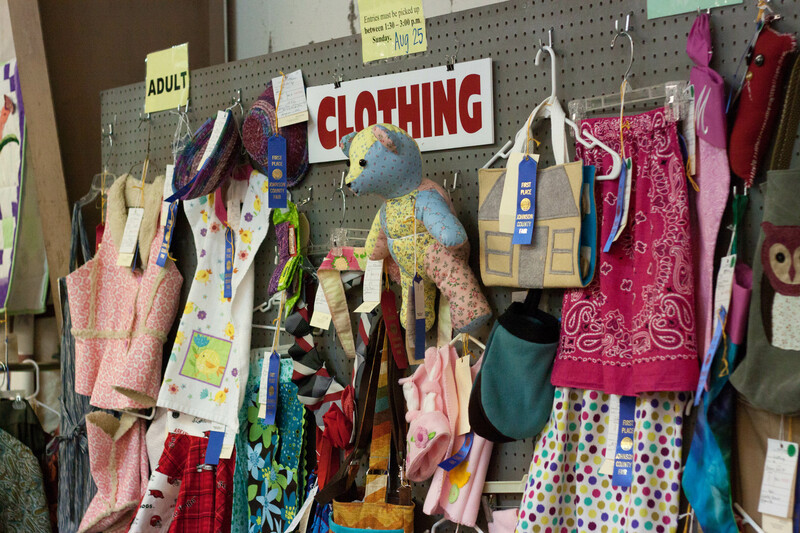 Blue ribbon exhibitors in each division are eligible to be designated as Judge’s Choice award winners. Judges will choose items for Judge’s Choice Awards. These items will receive a rosette and be displayed in a prominent location.